U.S. M1 Garand Leather Padded Cheek Pad WWII Authentic reproduction. 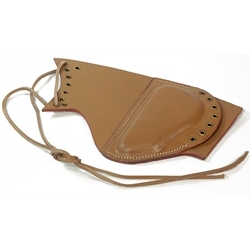 This is the protective leather pad for laced attachment to the M1 Garand Rifle. Used by US snipers in world war two the padded cheek pad helped to take some of the punishment out of firing these high powered rifles. Made from quality padded leather this pad is for right hand use. Note: Can be used with many different WWII type rifles.